2. Cheese, bacon, & other deliciousness. I'm so thankful that I don't normally have to eat everything by the spoonful. Functioning taste buds & food that requires chewing is a luxury missed when your diet consists of chicken noodle soup! 5. ... Feeling like you can breathe in general! Ha! 6. 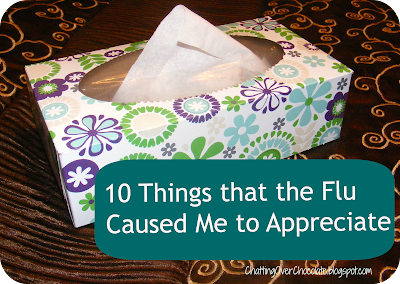 Being sick is humbling. It reminds us that ultimately we aren't in control of everything! Not even my obsessive compulsive hand sanitizing habit could stop this bug. I'm not in charge of how life goes. Humbling indeed. 7. My husband and I living out our marriage vows in the thick of life is a beautiful thing. Just before Christmas, my hubby seriously injured his dominant hand. For the first time in our 14 years of marriage we found ourselves living in a serious "in sickness and in health" season. While he's been unable to do the normally simple tasks, I've had the opportunity to care for and serve him in ways I previously hadn't. (I think he's thoroughly enjoying having his socks put on for him. ;)) He's improving with therapy, but only has use of one hand for the time being. Now, even though he is limited in what he is able to do during his time of recovery, he's done everything he possibly can to care for me while I've been so sick. By God's grace, the depth of our love for one another is illuminated during life's darkest days. 8. My daughters are growing up, and more capable and responsible than I've realized! I've been one of those moms who does almost everything for my kids. They are growing up so quickly and it brings me great joy to "mother them" in a gazillion little ways before they're "all grown up". My being stuck in bed has really allowed them to show me how much they really are capable of! I marvel at what sweet and responsible young ladies they've become! Oh sorry to hear you are ill! Most of us had the flu and my son has it now. What an awful virus! Glad you felt up to posting & hope you feel better soon! Thank you so much for the caring comment!! I truly appreciate it! Yes, it really is a nasty bug. So sorry to hear it's been making its way through your family. :( Hope your son feels much better soon!! What a great list! (: It's very cute! Hope you get better soon!! Hope you feel better soon, flu really is horrible! Ahh what great things to just remind us of what we have! All good points! 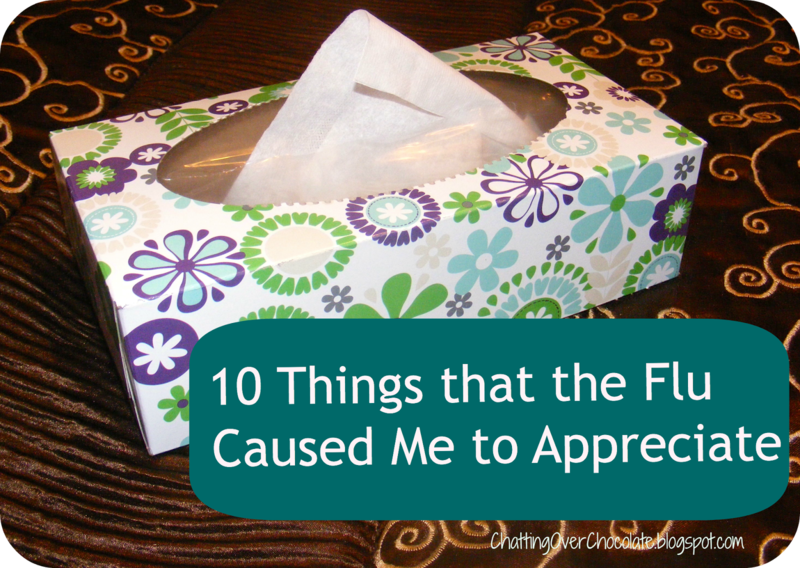 I had the flu over the holidays and I should have adjusted my attitude the way you did! You have a fun blog and some great recipes. Happy to be following you via GFC and looking forward to more! I forgot to mention that you are a "no-reply blogger". You can fix that in your settings if you want! Thank you for visiting my blog and leaving such a nice comment on my Valentine Bird Cage! I hope you're feeling better now. The flu takes so much out of you. I love your Tigger Tails, too! When I was sick after Christmas, I can't say I missed cleaning :) It was hard not to breath normally though.